(Nanowerk News) Despite high expectations and extensive research and investment in the last decade, technological options are still in developing stages and key resources for algal growth are still too onerous for economically viable production of algal biofuels, according to a JRC literature review ("Biofuels from algae: technology options, energy balance and GHG emissions: Insights from a literature review"; pdf). No large-scale, commercial algae-to-biofuels facilities have been implemented up until the end of 2015. With a 7% EU cap on the final consumption of biofuels produced from agricultural crops, algae have received closer attention in the last decade as a source of advanced biofuels. The authors find that the main barriers to large-scale deployment of both macro- and micro-algae, include high demands of key resources for algal growth (such as nutrients, water and CO2), difficulty in maintaining selected species with high productivity content in outdoor culture, as well as high energy requirements and costs of algal production and conversion into biofuels. Additionally, it is difficult to find land with suitable characteristics for algae growth and there are technical challenges of scaling up lab/pilot projects and cost effectiveness. Hence, the present technology to convert algae into biofuels is in an undeveloped state. The review presents the current status of technology options for the potential exploitation of algae as feed stocks for the production of biofuels. To this end, it offers a comprehensive overview of recent advances on promising algal biofuels production pathways, in terms of technological development, opportunities and limitations. JRC scientists analysed the main assumptions, modelling approaches and results of the life cycle assessment (LCA) of algal biofuels pathways currently available. They focused on the key parameters affecting the energy and greenhouse gas (GHG) emissions balances. A comparison of the performance associated to the algal biofuels pathways with that found for conventional fossil fuels is also reported. The results from the analysis may offer a valuable contribution to identify research priorities, opportunities and limitations to their overall effectiveness and potential environmental risks. Additionally, the techno-economic challenges and environmental impacts of algae-to-fuel strategies need to be properly assessed (comprehensive impact assessments are lacking) before implementing systems integration strategies leading to the deployment of the algal biofuels industry. Given the EU cap of 7% on the final consumption of biofuels produced from agricultural crops, there is increased interest in advanced biofuels produced from non-food materials, including algae. Because of its potential advantages compared to land-based agricultural crops, algae have received closer attention in the last decade as a source of advanced biofuels. 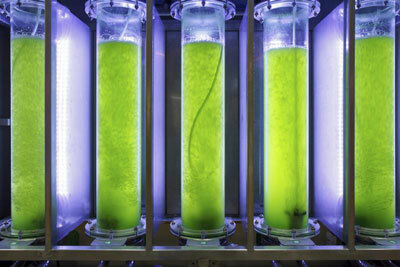 Production of algal biofuels is a hot topic for research, industry and policy makers.